Let’s hear it for Wendy from Pink Stripes; it was finally her turn to pick a recipe for the Tuesdays with Dorie bakers, and she picked one with the words “rum-drenched” in the title. That works for me, and for those who prefer not to use rum, there are non-alcoholic versions of the recipe. This is a vanilla pound cake with some dark rum in the batter. After baking, the cake is soaked in a sugar, water, and dark rum syrup. When I made the Dressy Chocolate Loaf Cake, some people commented that they couldn’t tell how big it was. 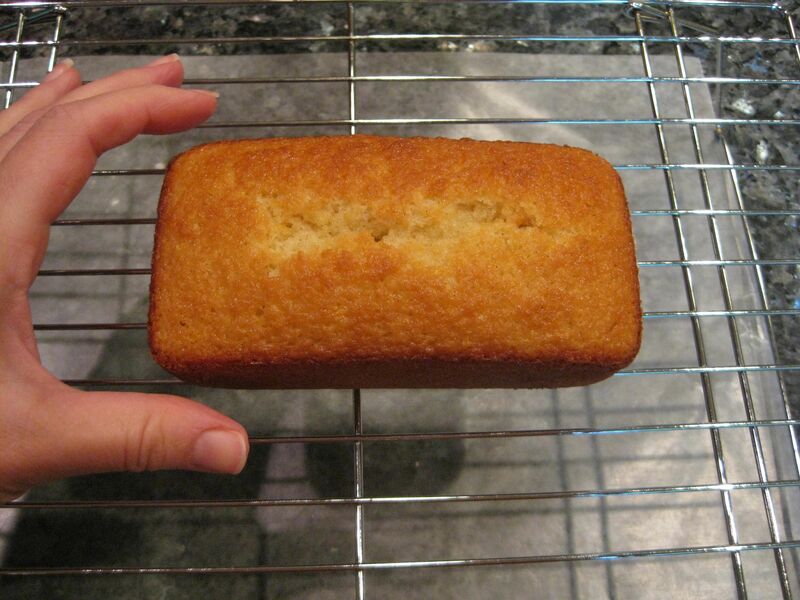 I baked this in the same mini-loaf pan, so here’s a photo with my hand as a point of reference. 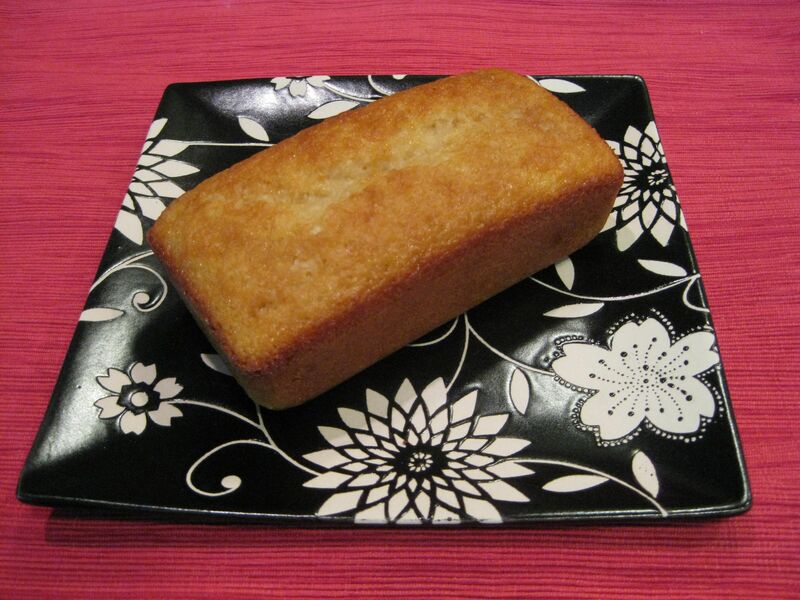 I pulled out my mad math skillz and made 1/6 of the recipe, which I baked in a 5.75″ x 3″ mini-loaf pan. I used vanilla bean paste, which I thing is a happy medium between real vanilla beans and extract. How it went: This was so easy to make! No long and involved mixing process, no problems. When I pulled this out of the oven and it looked like a cake, I patted myself on the back for my excellent calculations! How it tasted: I followed Dorie’s suggestion and waited until the next day to eat it. Was it worth the wait? Yes! The rum flavor was so smooth; I thought it was just the right amount for good flavor without overdoing it. My husband liked it a lot and thought it would be a good afternoon treat, like a snack cake. We liked it as-is, but I bet it would be good with some embellishments, like ice cream, a fruit sauce, or whipped cream. If you want the recipe, Wendy will have it posted today, or you can open your copy of Baking: From My Home to Yours to page 226. Like the picture with your hand. Gives perspective. I’m impressed with your math skills too. 1/6 th?? Wow! Holy cow – I’m so impressed with your math skills! I struggle with halving a recipe and somewhere near the end of the ingredient list I always forget I’m halving the recipe and foul things up! Great job on the mini loaf! Mini loaf pans, of course, why didn’t I think of that? Then we would not have had to eat it all in a few days (sans kiddos as it had rum in it after all)…next time, this is the way I am going. That cake looks stunningly perfect by the way. I love that plate (and not just because I have one just like it!) Your cake looks great and making 1/6 is pretty impressive. I didn’t think of using vanilla paste until AFTER I’d scraped the two precious vanilla beans so yay Jill! Yes, this is a great little cake, and I envy your math skillz! Your cake (and the plate) look beautiful-and nice math skills. I struggle to halve things sometimes!!!! Jill -I’m so impressed with your division skills! 🙂 Your mini loaf looks adorable – I have a whole pan of those and have never used it.. hm… this might be the perfect “re-do”! wooho for math skills!~ very cute cake too! My head would explode if I had to figure out the 1/6 recipe, but good on you for doing the work. It was really difficult not to eat the whole cake. Luckily I have a house full of snackers. Your plate and mini-loaf are gorgeous! You haz gr8 math skills. 1/6. So cute. What a perfect, cute lil’ thing. Your little tiny mini cake looks gorgeous! Thanks for baking with me! Impressive math skills and cute little cake! I used a vanilla bean for this cake, but I love vanilla bean paste – such a good value and excellent flavor. Oh, that little rum cake is the perfect snack size! I’m sure you were better than I would have been and shared it. Your mini loaf is just too cute! I like the taste of rum so this recipe looks like a winner to me. These were good, weren’t they. LOl at your point of reference – I thought it was a full size cake before I saw that!! And I love your b&w plate.